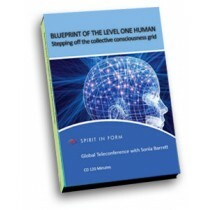 BLUEPRINT OF THE LEVEL ONE HUMAN-Purchase your instant download now! You may now purchase an instant download of this teleseminar! As humans we have been encoded with limiting concepts about what we are and what we can be. This has ensured a protocol of restrictions. In the networking system of human DNA can be found the coding for the level one human blueprint and all other potentials buried in what scientists refer to as junk DNA. We are dealing with a phantomic process. What we must awaken to is our ability to penetrate a barricade of protocols unnoticeably upholding this limiting human blueprint. Many find themselves driven to break free yet uncertain exactly what it is that they seek to break free from. We are bombarded by conspiracy theories, new age musings and an endless stream of confusion. We are screaming on the inside to touch a deeper place within us. We are lost within a level of cosmic technology that overshadows the endless possibilities within our own unique aspect of consciousness. How do we override the protocols, how do we step off the grid, how do we step through the portals within our DNA leading us beyond the illusion of limitations? I have always found that the best way to create personal evolution is by grasping the concept or formula. Its not necessarily about following a series of steps but rather to grasp an understanding of the layers standing between you and the evolution you hope to achieve. The aim of this and all my workshops and lectures is about self empowerment. When we understand the foundation upon which we stand and what that foundation is made of we can more clearly see our way through because we have the formula. You will be reminded that there is no final moment of evolution but rather an endless climb towards experiencing all of ones potentials. What you will come away with in this teleseminar is a certainty of your ability to evolve beyond your wildest imagination. You will understand the process needed to move forward from where you are at this moment. Come with an open mind and a readiness to break through your perceptual blocks and boundaries.